The Penguins had one of the best starts they've had in recent games against the Predators. It didn't prevent them from closing the game out as forcibly as they have on their streak of hot play. Phil Kessel scored two goals, Kris Letang added a goal and an assist, and the Pens defeated the Nashville Predators 5-2 for the 10th win in their past 11 games. The win shrinks Pittsburgh's magic number to 2 points, and coupled with the New York Rangers' loss against the Carolina Hurricanes moves the Pens into sole possession of 2nd place in the Metro with 5 games to play. The Penguins have struggled with slow starts lately, but at least for this game it seems like Mike Sullivan's message has gotten through the to team. Phil Kessel has been on fire lately, and it didn't take him long to get going in this one. Justin Schultz made a great play to freeze the defense and get Pekka Rinne down into his butterfly stance, and he made a perfect no-look pass to Phil Kessel at the left circle for an easy goal into the empty net. The Pens nearly got a second goal five minutes into the game when Sidney Crosby fed Chris Kunitz in front of the net, but Kunitz pushed the puck wide. Moments later Rinne would make a huge save on Patric Hornqvist after the Pens winger got the puck on the crease alone in front. A Carl Hagelin trip against Mike Ribeiro would halt the team's momentum, but despite having one of their best penalty killers in the box the Pens would be able to kill off the Predators' opportunity. The teams would return to 5-on-5 action and trade scoring chances back and forth. Calle Jarnkrok would have one of the better chances of the period off a snap shot from the left circle, but Marc-Andre Fleury was able to get his shoulder on the rising shot to keep the Penguins in front 1-0. 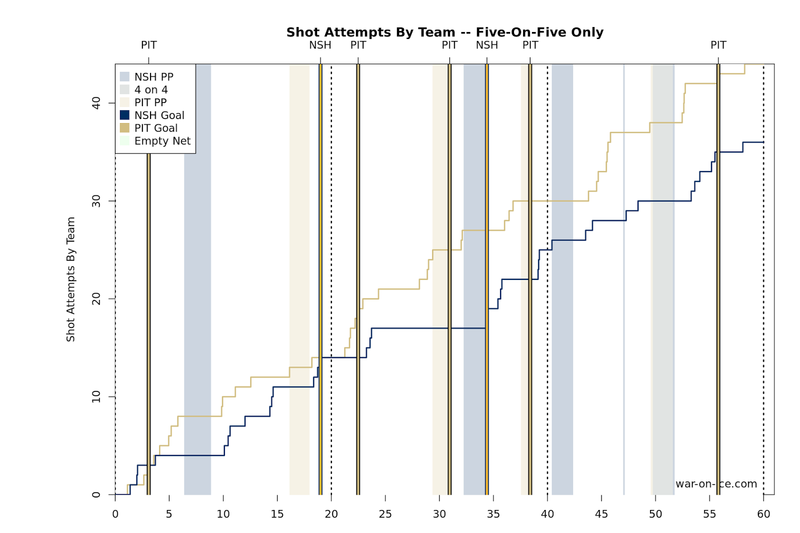 The Penguins would get a chance on the man advantage late in the 1st period when Mattias Ekholm hooked Kessel, but despite several good chances the Pens' snake-bitten power play was unable to put the puck in the net. The Pens would look to take the lead into the locker room, but James Neal would make a nice pass from behind the net to find Ryan Johansen in the slot, and Johansen would beat Fleury glove high to make it 1-1 heading into the first intermission. The 2nd period would start with the teams tied, but like the 1st period it was Phil Kessel quickly putting the Penguins in front. Kessel took a pass from Trevor Daley with speed entering the Nashville zone, and he snapped a shot past Rinne on the far side for his 25th goal of the season. Later in the period, Conor Sheary would split the defense taking the puck to the net and would draw a holding penalty from Petter Granberg to put Pittsburgh back on the power play. The team's troubled power play would finally get one up on the board when Kris Letang one-timed a shot from the top of the zone that cleanly beat Rinne for his 16th goal of the season to put Pittsburgh ahead 3-1. Sheary would be called for tripping Filip Forsberg shortly after, and while the Predators weren't able to tie the game on the ensuing power play they managed to get a goal seconds after the man advantage expired. Seconds before the goal, Fleury took a shot off the mask, and he tried signaling to the referee in the corner that his mask was broken. The ref didn't give him the stoppage in play he was asking for, and he was slow to track the resulting shot from Neal in the shot, bringing the score to within one goal again at 3-2. The Penguins would get another power play late in the 2nd period when Ian Cole was pushed violently into the boards in the corner behind the Pens' net. He would be slow to get up, but he would remain on the bench as Pittsburgh's man advantage took the ice. This time it would be the Penguins getting the goal late in the period. as Trevor Daley one-timed a shot from the right circle that clipped Roman Josi's skate and went off Patric Hornqvist's knee to go five-hole on Rinne to push the lead back to two. Pittsburgh would take the 4-2 lead into the second intermission, and the Predators would make a change in net when they came out for the 3rd period, benching Rinne in favor of Carter Hutton hoping to get a spark. And the Penguins tried helping them along in that regard as Kunitz took a double roughing minor against Jarnkrok's single roughing penalty to put Nashville on the early power play. But the Predators weren't able to take advantage and gain the early momentum in their comeback, and the teams would resume even strength play with the Pens still up two. Pittsburgh would get a power play midway through the 3rd after Colton Sissons was called for slashing Crosby, but Crosby would be called for goaltender interference just 12 seconds later after Hutton tripped over Crosby's leg after playing the puck behind the net, quickly taking away the man advantage and replacing it with 1:48 of 4-on-4 action. The extra ice wouldn't amount to a goal for either team, and the Pens continued to hold the lead and get chances in the Predators' end of the ice. One of the hallmarks of the Penguins under Mike Sullivan has been the aggressive nature of the team in trying to put games away, and this game was no exception. Carl Hagelin managed to get a stick on a loose puck from the top of Nashville's crease and tap it over to Nick Bonino, who was able to put the puck into the empty net to make it 5-2 Pittsburgh. Peter Laviolette would challenge the goal for goaltender interference, but after the review the refs upheld the play. The Penguins and Predators were neck and neck in possession on the season at 3rd and 4th in the league, respectively, but it hasn't mattered much who the Pens have played in recent games, and it didn't in tonight's game as they thoroughly controlled possession in posting a score-adjusted 57.4 CF%. The Pens will head into the weekend with a back-to-back against Metropolitan Division playoff teams, travelling to Brooklyn to face the Islanders Saturday before returning to Pittsburgh for the home-finale against the Flyers on Sunday.